These Quick Pickles are meant to be on your table within minutes, although they’ll be good for a few days after making them. Feel free to customize them however you’d like! Trim ends off the cucumbers. 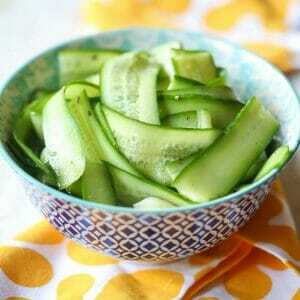 Using a vegetable peeler and steady pressure, shave each cucumber into ribbons and place in a small mixing bowl. Gently toss with remaining ingredients, cover, and refrigerate for at least 20-30 minutes. These are a delicious snack or try serving them on top of Greek- or Asian-influenced rice bowls and stir-fries, in tacos, on top of spicy grilled meats, or on sandwiches.